Skincare / What Are Wrinkles, Really? Your skin consists of three layers – the hypodermis, the dermis and the epidermis. The hypodermis is the innermost layer of your skin that is mostly made up of fat. The dermis is the middle layer of your skin. It contains your collagen and elastin (things that make your skin look young and supple). Finally, the outermost layer of your skin is the epidermis. The epidermis contains dead and hardened skin cells that form a protective covering to protect your body from the environment. The wrinkles are usually formed in the epidermis or the dermis, depending on the layers in which they are formed. 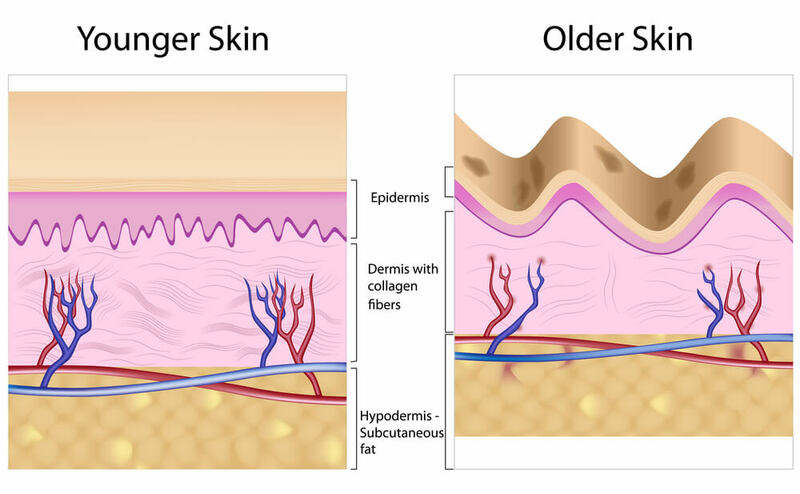 Your skin ages every day and skin cells located in the epidermis layer die and shed off on a daily basis. To counteract this loss, your body produces new skin cells in the dermis layer and allows them to replace the ones that were shed off. When you’re younger, the level of production of your skin cells is extremely fast. However, as you age, the production level gradually drops down. This ultimately results in dullness and wrinkles. Moreover, as your body ages, the skin loses its ability to retain moisture. The lack of moisture leads to fine lines. The appearance of the skin ultimately depends on the level and the quantity of the collagen fibers in your body (between the dermis and the epidermis). Your dermis is responsible for continuously generating fibroblast cells that regenerate your collagen fibers. However, the activity of fibroblast cells decreases with age, thereby reducing the level of collagen regeneration. Standard genetic processes are just one of the reasons behind aging. Unprotected exposure to the UV rays of the sun and damage from free radicals in the environment also plays a huge role in aging. Exposure to the sun can increase the pigment production levels in your skin, which lead to age spots over time. Exposure to the sun’s rays also breaks down your collagen fibers and make the elastin accumulate in the skin. This accumulation leads to the production of an enzyme known as metalloproteinase. The main function of this enzyme is to regenerate collagen after degeneration. However, sun damage does not allow this enzyme to function properly and this leads to improper regeneration of collagen which ultimately leads to wrinkles. Free radicals also damage the collagen and proteins in your skin. Yet another cause of aging is smoking. Now, since your genetics are not the only reasons behind the aging of your skin, you can easily control the other aspects to ensure that you delay the aging process as far as possible. Preventive measures can help you save your skin from wrinkles and other aging blemishes. But, what exactly are these preventive measures? The ways to protect your skin are actually quite simple. Cleansing your skin with a gentle cleanser and moisturizing your skin during the day and night is of utmost importance. Wearing sunscreens before stepping out of the house and replenishing them once in every 2 hours spent out under the sun helps to protect your body from sun damage. Skin care experts also recommend maintaining a balanced diet, eliminating stress, sleeping properly and using retinol or Resveratrol based creams to diminish wrinkles and fine lines. Remember, it is never too early nor too late to start taking care of your skin.